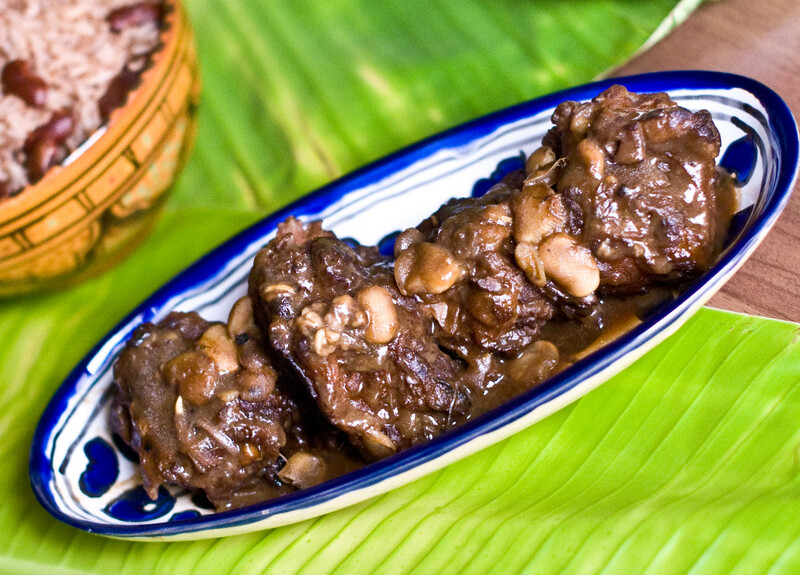 Oxtail is cooked frequently in the Jamaican home. Traditionally braised on a coal stove for long hours on low heat, the otherwise tough parts in the cow’s tail soften up into a lovely gelatinous consistency that makes you want to lick your fingers. 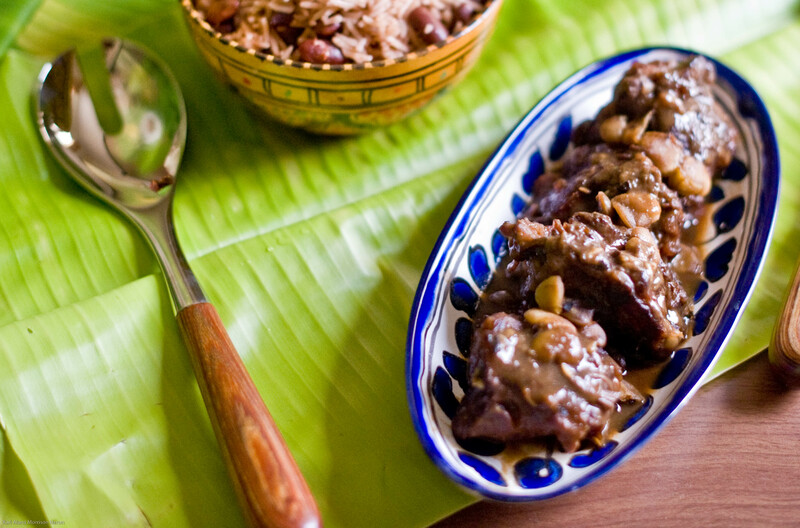 Jamaican Oxtail Stew is a favourite of The Chef (as noted in previous post). Though the variety he likes is made with little dumplings called ‘Spinners’ which we will post at some point. Since this was for the weekly column, we figured to leave out the Spinners this time and keep it simple. I posted a recipe before in the Jamaican recipe section but I am giving you a different recipe and step by step photos this time. No matter how tired The Chef comes home after a gruelling service, this dish is guaranteed to win big smiles and some favours for the Steward. We hope it does the same for you! Ingredients: 1kg oxtail, jointed into 1inch pieces, 2 tbsp sunflower oil, 3 onions, chopped, 1 stalk green onion /scallion, 4 cloves garlic, chopped, 15 pieces of allspice (Jamaican pimento), 4 sprigs thyme, Scotch Bonnet peppers or Habaneros to taste, 1 tsp browning, 2 tbsp oyster sauce, 1 tbsp Kikkoman soy sauce, Salt and black pepper to taste,½ lb cooked broad (fava) or butter (lima) beans — or 1 can to shorten time on your feet, 1 tbsp oil for searing. Set 1 stalk green onions, 2 sprigs of thyme and 1 garlic clove aside. Chop the rest of the fresh seasoning and herbs. Grind allspice/pimento berries. 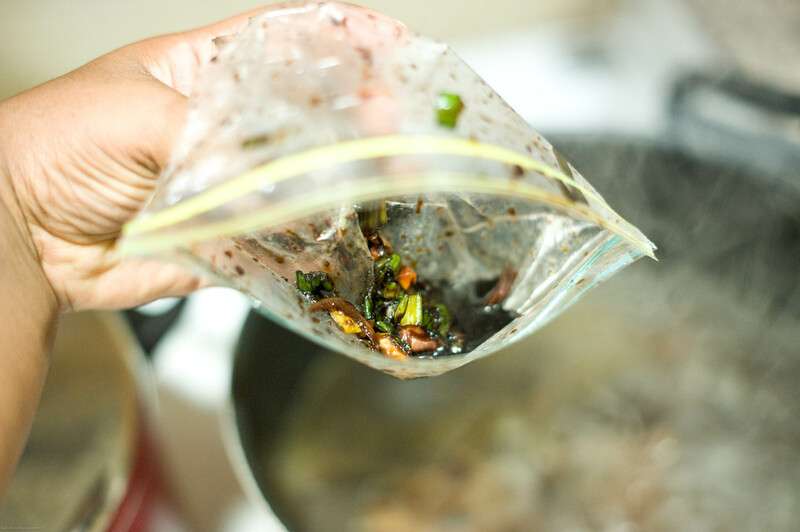 Measure out browing, soy sauce and oyster sauce in a big ziploc bad and add other seasonings. Do not add salt because this will toughen meat. Squish the seasonings around in the bag with the liquids and then add the meat a few pieces at a time, squishing around so all pieces are coated with the marinade. 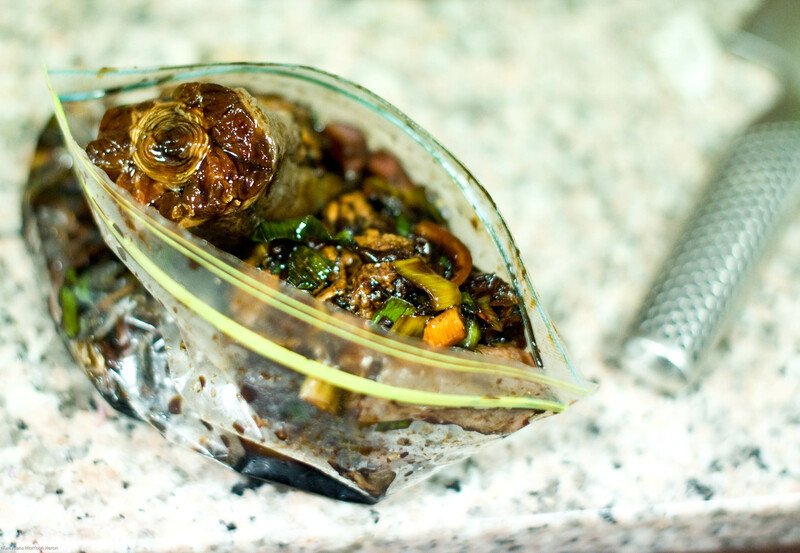 Marinate for 24 hours, or place in freezer for a future cooking date. If frozen, defrost overnight in the bottom of the fridge. 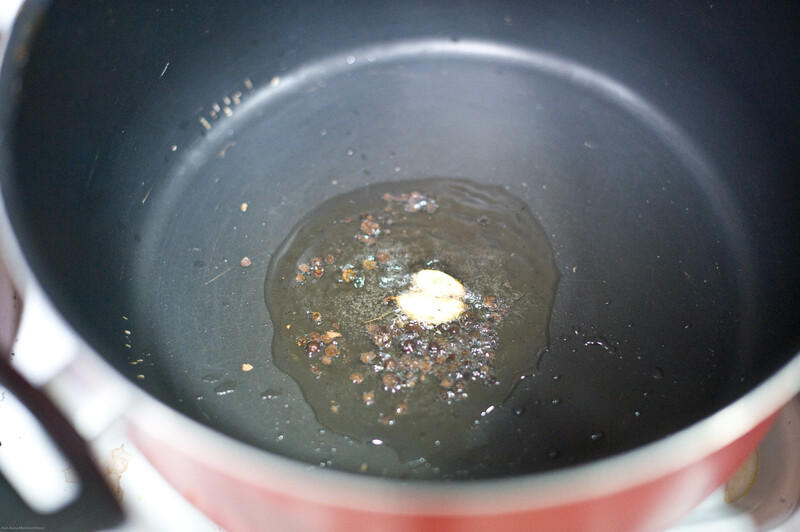 When ready to cook, add a few crushed allspice/pimento berries and a smashed garlic clove to some hot oil. Simultaneously put on your kettle to boil. Remove the seasonings and herb from the pieces of meat and place in hot oil. This is done to prevent them from burning during the searing process. Sear meat on high heat and turn frequently to prevent burning. 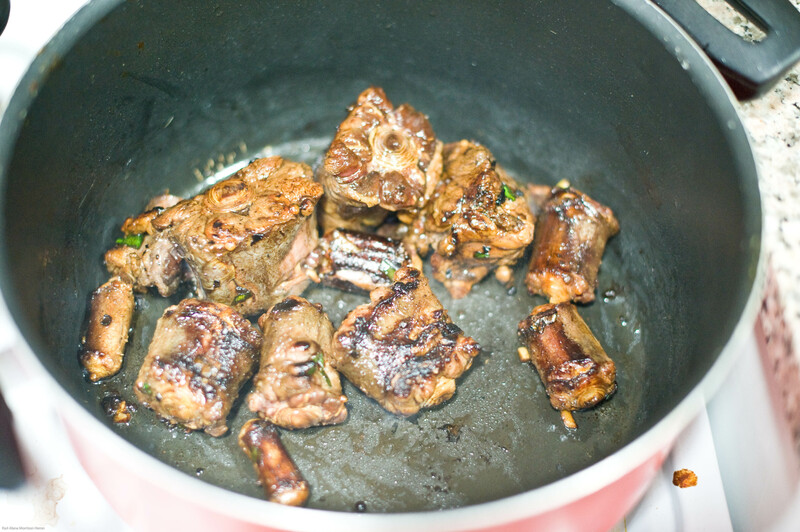 Meat will begin to carmelize, adding another dimension of flavour to the dish. If your casserole pot or dutch oven is not big enough for all the pieces of meat to be browned at the same time, sear meat in batches. 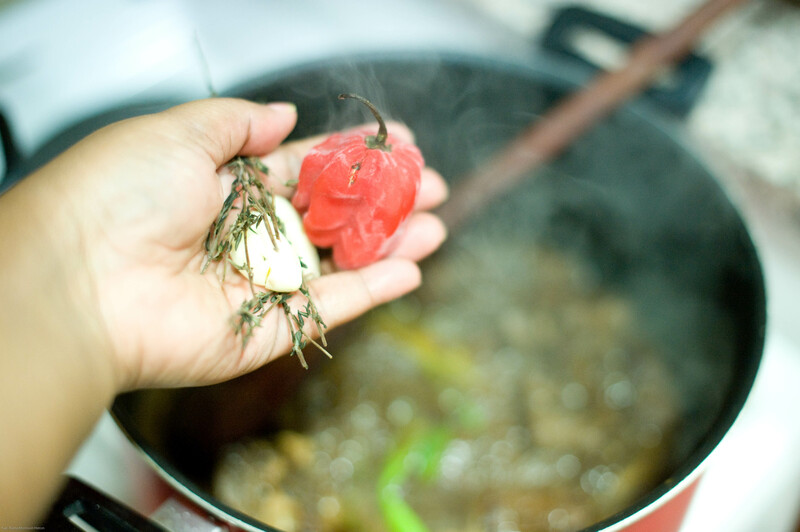 Once browned on all sides, add boiling water to cover meat and bring pot to a quick boil. Add the marinade to the pot. Skim any impurities (that frothing stuff) from the surface and discard. 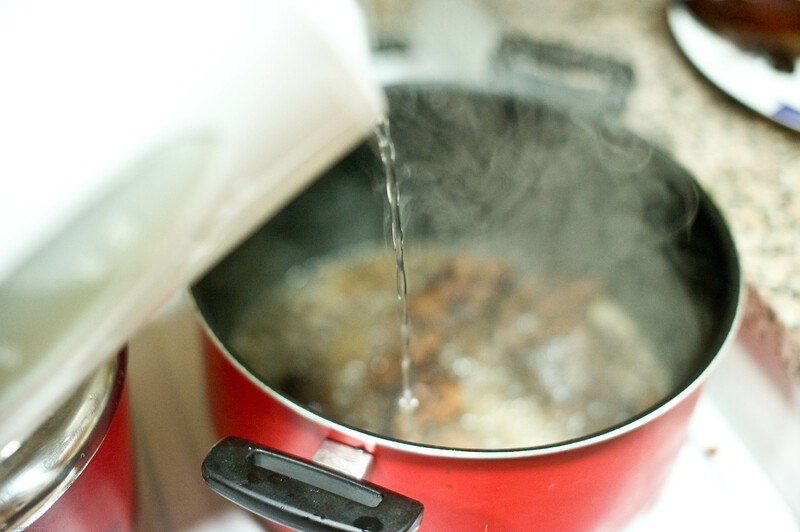 Cover and reduce heat to low simmer Cook for at least an hour, then check water levels to make certain that the water has not dried out. It shouldn’t dry out if you turned down the heat as directed. It will probably need at least another half an hour. It should be falling off the bone when properly cooked. It isn’t enough to just be soft, it must really be falling off the bone. When this happens, turn up the heat to rapidly boil and reduce or thicken the gravy. Season the pot again. Add the green onion/scallion stalk that you had left over as well as your thyme. We like the flavour of a whole scotch bonnet too. This is in addition to the pieces of the one we cut up for the marinade. Now that the stove is on high heat, you have to keep an eye on it and stir it frequently to prevent any sticking or burning. Leave the pot open for faster evaporation. Add the beans discarding 1/2 or 1/3 of the water in the can, and adding the rest to the oxtail. Stir and taste. Adjust any seasoning as desired. You may add salt and pepper as gravy continues to thicken. Skip the beans if you want to lower the carbs in the dish. Serve hot with Rice and Peas or Cauliflower Rice for a low carb alternative. 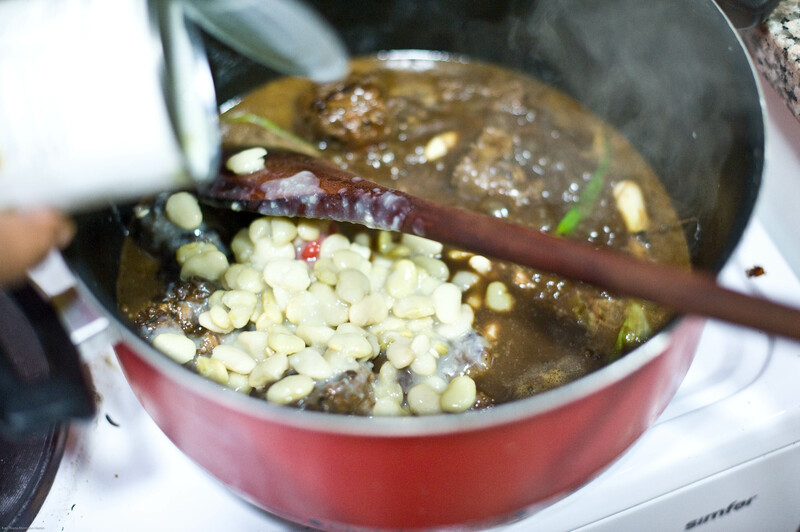 CHEF’S NOTE: Braised dishes are even better the next day when all the flavours mature. The key to successful braising is cooking the meats on a low simmer and not trying to rush it by rapid boiling. This results in a very succulent texture that falls off the bone and gelatinous bits that melt into your mouth. The best parts to braise are though tough parts like tails, legs, shoulders, shanks and feet which have a lot of tendons which turn into gelatin when slow cooked for long periods. These cuts may also be done in a pressure cooker, slow cooker or braised in the oven. Delicious. Love a bit of slow food. Find I cook it less here due to the heat. I think it’s best eaten out of a chipped terra-cotta bowl in front of an open fire tucked under a wooly blanket. Happens rarely in Dubai! I know what you mean about the chipped bowl and the whole comfort element. Funny enough, in the tropics this is eaten all year round! Lovely! I had braised oxtail the other night at Tribes – it was soooo good! 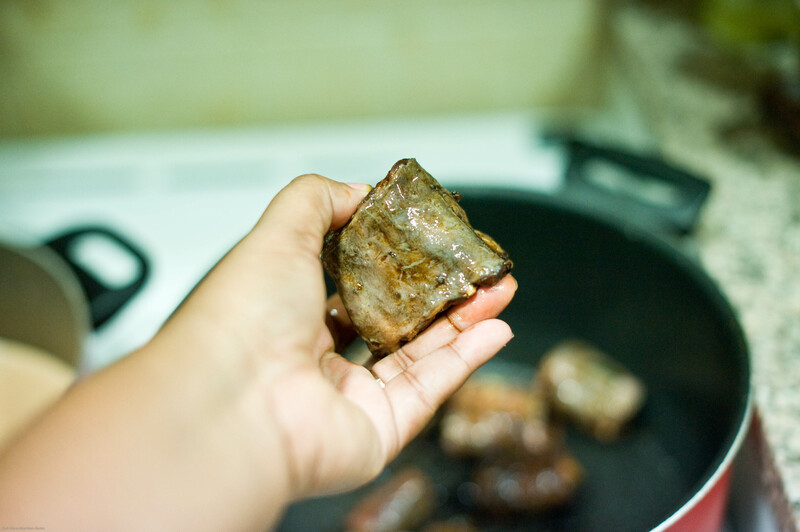 Do you get your oxtails from Carrefour or is there a better place? i find that their’s doesn’t seem to have much meat on the tail. I got these ugly bits in the supermarket but I always buy it at the market. That way I can get it cut the way I want it. What kind of restaurant is Tribe? Yummy! I can almost taste the meat melting in every bite 🙂 This meal might just give me luck to get that purple le creuset I’ve been asking my husband. btw, is “browning” a spice? Browning is an ingredient used in cakes (especially fruit cakes and buns) and savoury dishes to impart colour and flavour. It is usually made from carmelized sugar. Too much will make your food bitter. Is it available at C4? It should be… not hard to find generally… it is a liquid. Look either in the baking section or the sauces/spices sections. I will also try to remember to look out for it too today when I head there. Update: None seen in C4 MOE. I forgot to get my fabric softener, but I remembered your cause. You can try Spinneys or Lulu’s. I will continue to look out for you. I guess I really want you to get the LeCreuset (and a play partner for V at the same time). 🙂 Thanks Kari! I’m searching the internet to have some idea how it should look like but cant find any. The chef bought it and doesn’t remember where but try Spinneys or Lulu’s. OMG! MY FAVORITE JAMAICAN RECIPE, WITH PHOTOS!! i love love love this…had it at Bluefields the first time in Dubai, and then the place shut 🙁 Now this gives me my very own make-at-home with pics version, thank you Kari!! Awww… so happy to fill that void love! I am sure you will love it! But do come back and give us your review! You had me at “Jamaican” and “comfort.” Now, if I make this, will I be magically transported to Jamaica? That’s how it works, right? I tell you what, cook it and see if you don’t forget where you are! Thanks to you, now I can try making it at home to soothe my cravings. Can’t wait! We love that we can give you a bit of what you have been missing! Enjoy! I’ve never had oxtail before but it looks delicious. I love watching you put layer after layer of flavor on there and yes, getting the meat to start caramelizing is huge! Thank you for taking the time to photo this step-by-step for us. Thanks, too, for the recipe. OMG you HAVE to step out of your house even if you are still wearing bed slippers and head straight to the butcher or supermarket! This is soooo worthh it! Love oxtails!! My mom used to make oxtail soup and it was the epitome of comfort food. They’re not so easy to find around here and when we get them there almost espensive as buying gas! Sandra we only stew oxtails in Jamaica but we have been toying with the idea of some soup with it. I know.. they are no longer cheap cuts because all the foodies have now discovered what they have been missing! 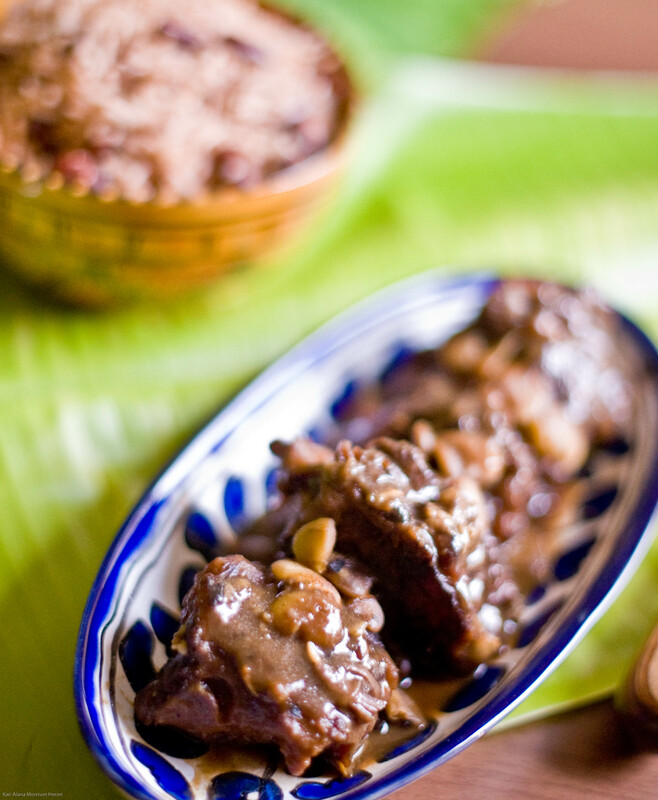 Oxtail and legs have lots of gelatinous consistency and very good with slow cooking and very tasty. Great recipe similar to Chinese ingredients and more! You hit the nail right on the head as to the secret of the deliciousness that is hidden in the tail of the lovely cow! Photos are delicious and recipes are surprisingly refreshing. Thank you! I’ve bookmarked you for regular visits. Olivia, thanks so much for joining us here and for your warm review. We try to be different to add value to our readers. Come by ours anytime! If you make this recipe using ground allspice berries rather than whole berries what s the equivelent in teaspoons please? That should be about 2 teaspoons of ground allspice.